I've blogged about Slices for Smiles before (for those who aren't aware, Slices for Smiles is a fundraising partnership between Canadian fast food giant Pizza Pizza and all major Canadian children's hospitals via the Children's Miracle Network of hospitals) - and recently my brother-in-law Lorne received an advertisement via email that it was coming back for its second two week stint of the year. "Pizza Pizza´s fundraising campaign for Slices for Smiles is a year-long initiative. There are a number of ways to get involved and support a great cause! Your own fundraiser: organize an event with your family, friends or community to help contribute to the Foundation. Customer Appreciation Days: held at locations across the country, these events feature fun activities and donation drives. Bring the whole family for pizza, games and fundraising for children´s charities. 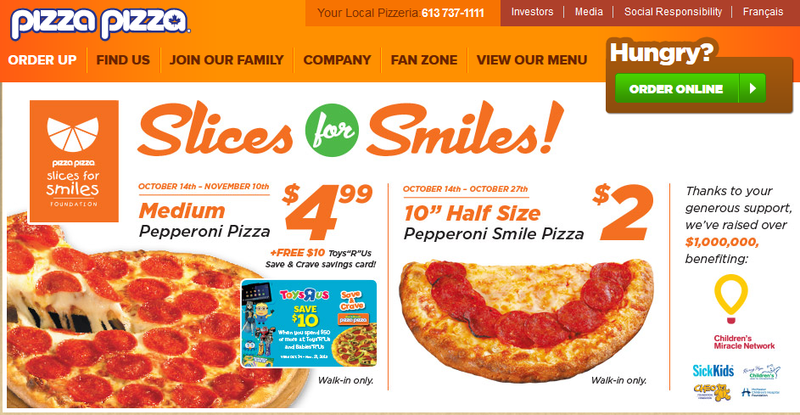 Slices for Smiles weeks: Show your support during Pizza Pizza´s Slices for Smiles Weeks throughout April and October. Purchase special menu items or add a donation onto any order." According to Pizza Pizza the partnership has raised $1,000,000 for the network since 2007. 12 hospitals are supported by the Children's Miracle Network. $1,000,000 divided by 7 years of fundraising = $142,857.14 per year. $142,857.14 divided by 12 hospitals = $11,904.76 per hospital per year. Well as least here in Ontario, in return for a measly $11,904.76 a year, Sick Kids Hospital in Toronto, McMaster's Children's Hospital in Hamilton, and the Children's Hospital of Eastern Ontario (CHEO) allow year long store based co-branding of their institutions with Pizza Pizza, and then spend a full month directly promoting, permitting and health washing the sale of fast food pizza - a food that is the number one provider of sodium in the average North American child's diet and the number two provider of calories (behind sugar sweetened beverages). So, doing the math, assuming an equal split between hospitals, the annual return for the childrens' hospitals for health washing fast food pizza amounts to $32.61 per hospital per day. While personally I'm of the mind that no amount of money would justify the co-branded sale of junk food by hospitals, here's hoping the hospital administrators take a moment and ponder whether or not their ongoing help at normalizing the regular consumption and purchase of fast food might be worth more than $32.61 a day, which assuming an equal split between hospitals, in the case of CHEO, over a year, represents 0.005% of their annual revenue which in turn covers a grand total of 4.36 seconds of their daily operating expenses. I mean if your hospital is going to be a complete and total sell out, might as well go big or go home, no?